E-newsletter design is a common problem with many companies. This is partly because email engines are built using old technology and when you mix this with todays new technology + retina screens + devices; you get a minefield of continual testing and seeing how your information displays. yyyyxxxxxxxxx Following the Elvetham Hotel's recent re-branding; they commissioned Aquatint to design and build 4 x new e-newsletter templates to send out from the various departments of the hotel. 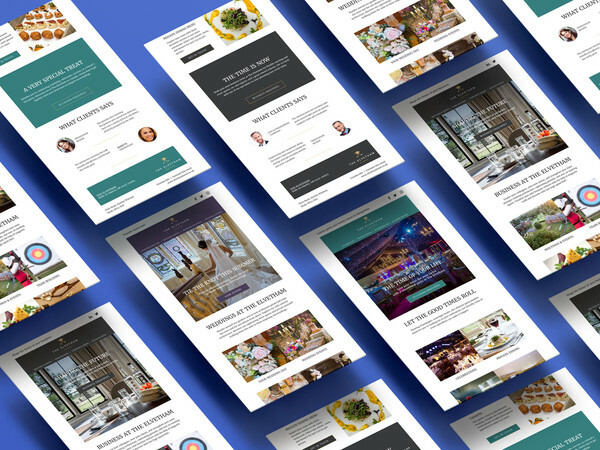 The chosen newsletter platform was Mailchimp and The Elvetham required a lot more design flexibility than is currently available in the standard mailchimp interface. The templates were to be completely modular (down to the button) and each template needed to be connected by a common look and feel, maintaining the ability to pull in any element as required. The design team presented a core design template to include all elements required. The template included modular sections that could be duplicated and moved around to create the feel of multiple templates. The 4 newsletters were mocked up with dummy content, highlighting how each newsletter may look. Following design sign off, the HTML pages were built and made available directly in The Elvetham's mail chimp account. The code was modified enabling images to produce as they should on retina screens. We considered the Outlook 2007 - 2010 issues that are well known for being troublesome in displaying design and graphical elements. The 4 templates have been designed specifically for The Elvertham Hotel. The issues of display common to Outlook 2007 - 2010 have been catered for, and the quality of image display has been enhanced to work across all devices including retina displays.